Self-driving trucks are one of the issues being discussed nowadays. Some people discuss it with interest and curiosity; others harbor some fear to one degree or another. Maybe others outside the logistics and supply chains industries just don't care. The fact is, some experts say it will take two decades (20 years) before self-driving trucks are fully put into place as a real alternative to moving cargo. In a recent survey by Inbound Logistics, the majority of respondents felt that self-driving vehicles would have the most clout in the industry as compared to a few other alternatives such as uberized deliveries and drones. Time will tell, What's YOUR thoughts? Leave us a comment. 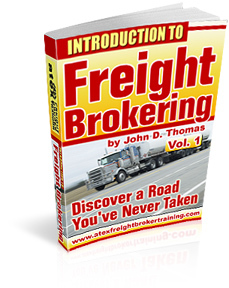 Many people who call or email with questions think they need to purchase freight broker software. After all, technology can provide a real pop to business transactions. But, here's the truth. Software is not needed, starting out. Yes, I do recommend using some type of general ledger software to record income and expenses and to send invoices and prepare checks. QuickBooks is the winner here. Other than that software, we provide spreadsheets that are ready to go for recording, monitoring and analyzing load activity. Your first line of duty is to get customers and the best software in the world won't help on this; it will help MANAGE your customers and loads once you build a good base of activity. But it won't help in your search for customers. Keep this in mind and don't spend a lot of money on freight broker software until the business demands it.